Deswell Industries went up 53% in the more than six years that I held the position, and while that is not bad, you would expect a mediocre annualized return. But thanks to all the dividends ($1.04/share in total!) that the company paid in the meantime the internal rate of return was actually a pretty satisfactory 15.10%. Better than I expected before I did the math for this post. This entry was posted in Portfolio and tagged DSWL on June 19, 2018 by Alpha Vulture. I was thinking about adding some shares after the last earnings report. The top-line was impressive and the bottom line heavily impacted by items that are probably temporary (FX, raw material cost). 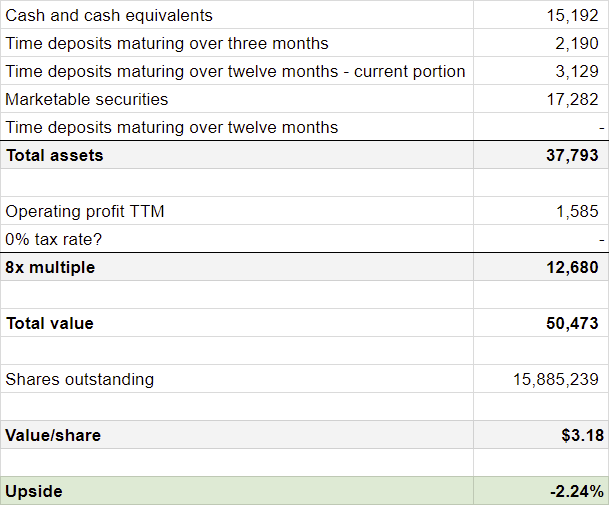 I have no idea how sustainable the current top-line is (and if there is room for even more growth), but the insider buys up till 2.70 a share provide some comfort. Decided not to add until I see further insider buying. I agree with you that a going private transaction seems a likely scenario in the long-run. I know that your calculation is a back of the enveloppe one, however looking a bit different at the numbers can have quite a big impact here. – Value of PPE / rental income: The company leased part of their properties to third parties for 839k USD in FY17 and increased this to 630k USD in the last 6 months. Resulting in a run-rate rental income of ~1.2m USD. I think it makes sense to add the majority of this to the operating profit in your valuation. Yeah, that a fair point. Adding rental income to operating income would be fair. No so sure about your view on future gross margins. Was 16% in 2018 which isn’t too bad considering it was around 10% in 2014, 2015 and 2016… and there is also the issue of taxes. They haven’t paid a lot in recent years, but I believe their theoretical tax rate should actually be 25%.